(Haliaeetus leucucephalus) The bald eagle, with it’s snowy-feathered (not bald) head and white tail, is the proud national bird of the United States. We love hearing the amazing call of the eagles throughout the zoo. 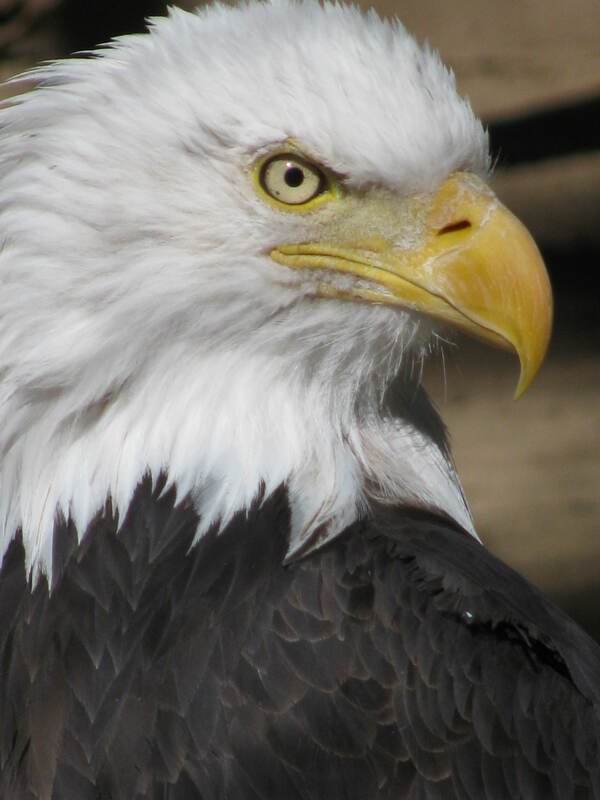 Bald Eagles are carnivores and mostly eat fish. Bald Eagles will take advantage of carrion (dead and decaying flesh) and will also kill small animals for food. It’s possible for bald eagles in the wild to live longer than thirty years, but the average lifespan is fifteen to twenty years. A captive eagle at West Stephentown, NY lived to be at least 48 years old. How many Bald Eagles can be born at a time? Females lay two eggs each year. Bald eagles live along the coast and on major lakes and rivers where they feed mainly on fish. They can be found throughout the United States (except Hawaii) and can be seen year-round flying over Big Bear Lake. The bald eagle, with its snowy-feathered (not bald) head and white tail, is the proud national bird symbol of the United States. A Bald Eagles body temperature is about 106 degrees Fahrenheit. Bald Eagles do not have vocal chords, they have a syrinx instead. Eagles do not sweat, so they need to use other cooling methods such as perching in the shade, panting, and holding their wings away from their body. A bald eagle’s skin is protected by feathers lined with down. The largest bald eagle nest on record was 9.5 ft wide and 20 ft high. It weighed more than two tons. An Eagle does not get its distinctive white head and tail markings until it is about 5 years old. A bald eagle has a wing span from 6 to 8 feet. Bald eagles are believed to mate for life. Valentine – was brought to us in 2004 by Fish and Game. She had severe cataracts from DDT poisoning and could only see shadows. Valentine was brought to us on February 14th 2004 and that’s why we named her Valentine! For the first time last year, she and Alaska had an egg. They were excellent parents and both took turns sitting on the egg. Alaska even threw straw on top of Valentine and the egg to keep them warm. Unfortunately the egg didn’t hatch, but it was still very exciting, and now we know they will make very good parents some day if they have a fertile egg.